Dr. Tiomara Paylor, D.P.M. is originally from in New York City, where she graduated from St. Catharine Academy High School. She was granted a scholarship from the Office of Naval Research and obtained her undergraduate B.S. degree in Biology from Florida A&M University. She then went on to attend Barry University in Miami, Florida where she earned her Doctorate in Podiatric Medicine. 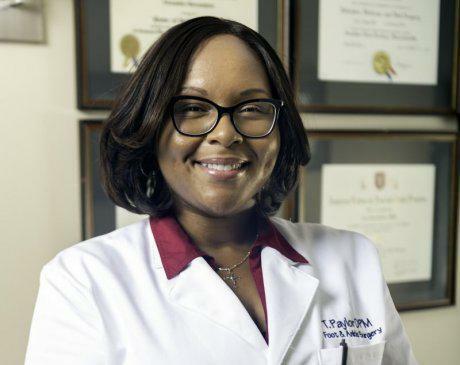 Dr. Paylor completed her surgical residency at Virtua West Hospital System in South Jersey where she served as chief resident in her final year. Dr. Paylor is an experienced foot and ankle specialist. She specializes in the management of all foot and ankle conditions including wound care, heel pain, plantar fasciitis, heel spurs, ankle sprains, sports injuries, flat feet, bunions, hammertoes, foot and ankle fractures, tendonitis, diabetic foot care, corns and calluses, toenail fungus, warts, althlete’s foot and gout. In addition, Dr, Paylor offers individually designed custom molded orthotics to help correct chronic and/or pathologic foot abnormalities and improve foot function. She strives for good patient communication, which includes explaining the diagnosis and outlining an individualized treatment plan with conservative and surgical treatment options. Dr. Paylor is a member of American Podiatric Medical Association, Virginia Podiatric Medical Association and the American Diabetes Association. Outside of the office, Dr. Paylor enjoys spending time with family and friends. Her interest also include kickboxing, traveling and being an active member of the health ministry at her local church where she enjoys providing foot screenings, educating the community on management and prevention of foot and ankle conditions.